Trauma to the midfoot region either direct or from twisting movements. Flatfoot deformity that has progressed over the years. When due to a flatfoot deformity usually associated with a tight calf muscle. Mild to moderate lowering of the longitudinal arch with weight-bearing. Pain with weight-bearing and difficulty walking or running. Possible prominent bone on the top or inside of the arch indicative of advanced changes. Extreme tenderness to palpate the joint on both the top and bottom. Thickening of the ligament on the bottom of the joint. X-rays usually reveal narrowing of the joint surface. Bone spurring may develop on the top or inside of the joint. The joint appears to have collapsed in that region. For mild cases the use of a well-molded custom molded orthotic in a running sneaker may provide some benefit. May need Achilles tendon lengthening if severely contracted. Moderate to severe cases that are unresponsive to conservative care usually necessitate a fusion of the naviculocuneiform joint. These joints can be fused with no expected long-term adverse effects. Can usually return to all sports and have a complete recovery. 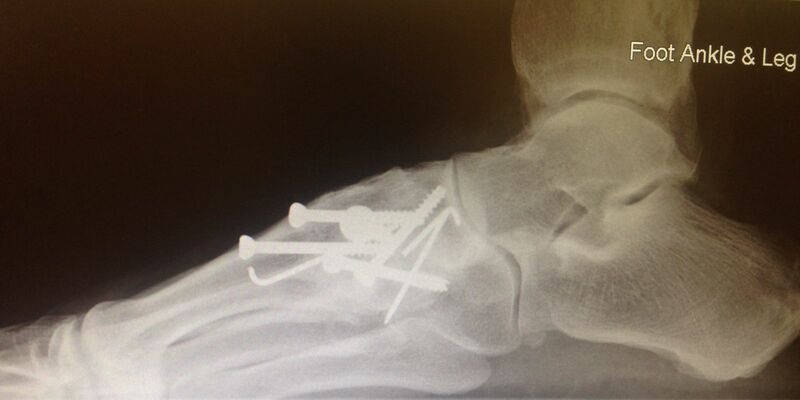 The image below is that of a navicular-cuneiform dislocation.